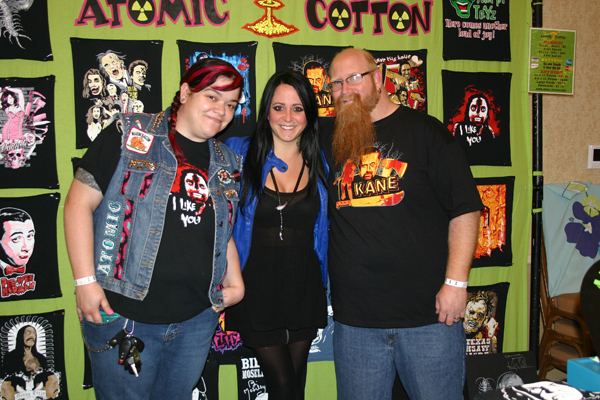 I attended Days of the Dead Friday night, but continued onto HorrorHound the following day. I could not miss a chance to see one of my favorite people in the world, Laurence Harvey (Human Centipede II & III). So I made my way up to the windy city to hang with Brian Steward and Atomic Cotton. The celeb line-up was stellar: Derek Mears (Friday the 13th), The Devil's Rejects crew (Sid Haig, Bill Moseley, Leslie Easterbrook), The Nightmare on Elm St. girls (Heather Langenkamp, Amanda Wyss), Fright Night reunion, John Dugan (TCM) and on and on. After the show Laurence, Erica and Zack Kaffman (Atomic Cotton), Rose and I had a lovely dinner at the hotel lounge. Check out the rest of my photos HERE. Days of the Dead typicaly throws 3 shows each year: Atlanta, Indianapolis and Chicago. Next year they have added Los Angeles to the bill and it should be their biggest yet.